A few years ago, when we first joined a CSA, we were swimming in zucchini. 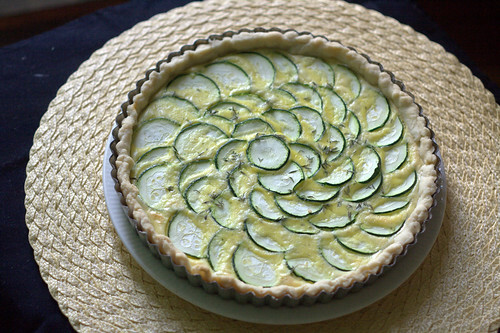 Taking my inspiration from vegetable quiches I had been making earlier in the season, I topped a savory custard with thinly sliced zucchini and yellow squash. The result was a hit – it kept well in the fridge, tasted good warm or at room temperature, and was perfect for picnics and polo matches. Here’s my basic recipe. I’m sure you can imagine many variations. I just use what’s in the fridge – I’ve tried it with many cheeses, herbs, etc. and it’s very adaptable. 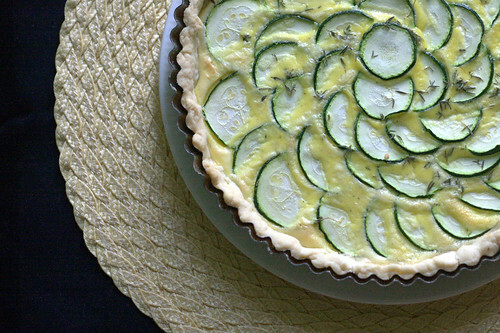 In a springform tart pan, prepare crust and pre-bake as directed. Set aside to cool. Cut the round end off the zucchini and slice 1/8 in. thick – much easier with a mandoline! In a medium bowl, whisk eggs with a fork. Whisk in milk. Season the egg mixture with some salt, white pepper, garlic, and tarragon. Sprinkle the grated cheese over the crust. Gently pour the egg mixture over the cheese into the crust. Now the fun part: starting around the egde, lay down the zucchini slices one by one, overlapping the edges. Instead of trying to spiral the slices, I find it easier to start with one big circle, then make a smaller circle inside it, and so on. It may look messy at first, but don’t worry, it’ll be fine in the end! Bake at 375 for 30 minutes or until set. Wiggle it or gently poke a zucchini slice to test. Allow to cool, slice, and serve. P.S. When I saw the Slice it Up recipe contest from OXO, I knew I had to enter. I love my OXO tools – for this recipe I’d use my mandoline (actually, I think my parents bought it for my husband, but I’ve taken it over), and my cheese grater. I’m also totally enamored with my OXO vegetable peeler. I’m not just saying this for a contest, I really do love these tools! Previous PostChicago Day 1Next PostHappy Bike Month! Congrats on the 3rd place win.